Tutwa Consulting Group – Border Economies: Bottlenecks or Growth Zones? Border Economies: Bottlenecks or Growth Zones? 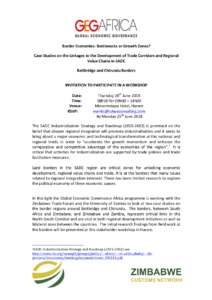 The SADC Industrialization Strategy and Roadmap (2015-2063) is premised on the belief that deeper regional integration will promote industrialization and it seeks to bring about a major economic and technological transformation at the national and regional levels in order to “accelerate the growth momentum and enhance the comparative and competitive advantage of the economies of the region”. It is critical that activities for industrialization are supported by trade policies and trade facilitation measures. Land borders in the SADC region are critical zones for unlocking economic development, regional value chains and trade. It is at the borders that many issues related to regional integration intersect. There has been limited research to explore the political economy of these economic spaces. In this light the Global Economic Governance Africa programme is working with the Zimbabwe Trade Forum and the University of Zambia to look at two case studies on the border regions around Beitbridge and Chirundu. The borders, between South Africa and Zimbabwe, and Zimbabwe and Zambia, represent critical links in the North-South Corridor and are vital in both regional development initiatives as well as bilateral ones between the countries. The initial research findings from field work at the borders will be presented at this stakeholder workshop in Harare. The full programme is available here. Please email your RSVP to events@tutwaconsulting.com by Monday the 25th of June 2018.